After the Civil War, African Americans were free but not equal. The Civil Rights Acts of 1866 and 1875, and the Fourteenth and Fifteenth amendments to the U.S. Constitution, were made virtual dead letters by hostile court decisions, culminating in 1896 in Plessy v. Ferguson, which gave legal sanction to the principle of "separate but equal" facilities segregated by race. In fact, separate facilities for blacks were hardly ever equal. They were inferior because segregation—the separation of people based on skin color—was based on the idea, expressed in the Supreme Court's Dred Scott decision of 1857, that blacks were "an inferior and subordinate class of beings." Despite the Civil War and emancipation, this remained the attitude of most whites and, hence, of governments. Jim Crow, taking its name from a fictional minstrel character, was the name given to America's own system of racial apartheid. In Virginia, the South, and some northern states, Plessy v. Ferguson, both confirmed the status quo and gave impetus to even more rigid segregation laws. Blacks had to sit at the back of streetcars or stand if there were not enough seats for whites. They were made to sit at separate sections of theaters, libraries, and train stations. They could not use water fountains, bathrooms, beaches or swimming pools used by whites. They could only order takeout food from restaurants that served whites. They attended separate, usually ramshackle schools. Social life and everything from sports teams to funeral parlors were segregated. When blacks gave blood, it was segregated from that of white donors. As black men and women in the uniform of their country traveled, they often could not use restrooms at bus and gas stations and were directed instead to a nearby tree. After Korean War-veteran Thomas Hardy returned home to Virginia in 1951, he wondered "What was I fighting for?" 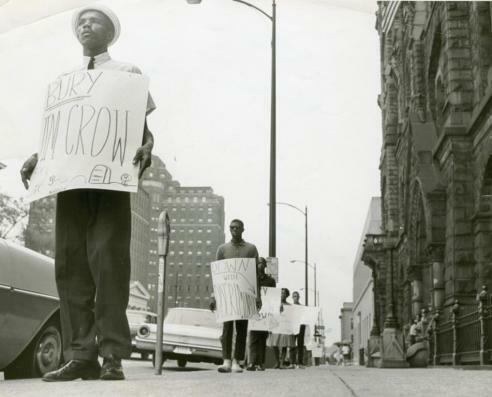 Protestor with sign: "Bury Jim Crow"